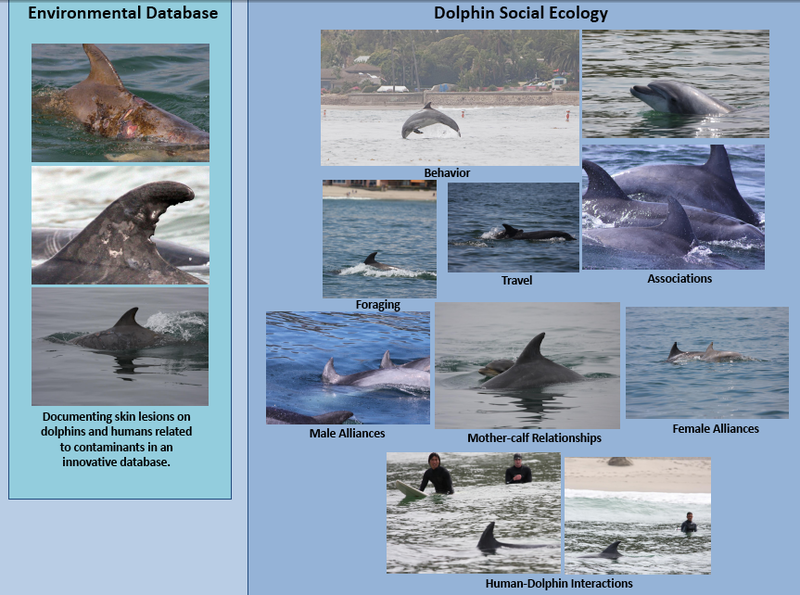 The scientific and student-fueled component of POD is the Dolphin Psychology and Ecology Project. This project is led by Dr. Toni Frohoff, whose pioneering research has received much international attention in numerous scientific and popular publications, the media, and from working with various government agencies around the world. We are very excited about this project for many reasons, including the interdisciplinary aspects of various fields of study that intersect to reveal a more holistic picture of who these dolphins are – what their communities are like – and what they need to maintain and restore physical and psychological well-being. Students are learning and gaining invaluable experience while simulataneously contributing to important research to help the dolphins. “California Coastal Dolphin Population in Santa Barbara Relative to Monterey Bay“: Research presented by Dr. Toni Frohoff and UCSB student, Lindsay Griffin of POD in collaboration with neighboring researchers in Monterey (Dr. Daniela Maldini & Mark Cotter of Okeanis). In our first year on the water, POD has already revealed new and important data about the dolphins of Santa Barbara with respect to their travel along the California coastline at two conferences! Supporting students’ careers is paramount to our cause … and we are delighted that UCSB student, Ms. Griffin, co-authored her first academic publication with POD! This work was presented at both the International American Cetacean Society’s Conference and The Southern California Marine Mammal Workshop. To view this research please click here. The Dolphin Psychology and Ecology Project (or “Dolphin PEP”) is beginning to provide what would be the first and much-needed intensive baseline data about the coastal bottlenose dolphins (Tursiops truncatus) of the Santa Barbara region. Part of this involves documenting population structure, number of individuals, movements, social association patters, etc. For example, we see coastal bottlenose dolphins (Tursiops truncatus) ‘daily’ along our Santa Barbara coastline … but are we seeing the same group that just travels back and forth a lot? Or are there various groups that change and intermingle with other groups of dolphins north or south of us? Recent changes documented in these dolphins warrant much more in-depth research to provide for their well-being and survival (please see home page or contact us for more information; much of which will be posted here soon).Before leaving Los Angeles over twenty years ago, Toni conducted a pilot study to identify coastal bottlenose dolphins in Santa Monica Bay, Los Angeles. Since then, we are thrilled that research on these dolphins has been conducted around Los Angeles, south in San Diego, and and north into Monterey Bay and surrounding areas. But until now, no one has ever conducted an intensive study to identify our coastal dolphin neighbors in the Santa Barbara/Ventura region. Of all the coastal California communities, it is perhaps Santa Barbara that most iconically embraces these dolphins in its culture, art, and even commerce. Previously, the Chumash and other indigenous people in this area shared a long history living alongside the dolphins. We honor these peoples’ history and traditional knowledge and are embarking on a program to learn more about it and hopefully support its restoration in some way. Much, much more to come … we are just just beginning here and there is much work to be done.